General Plastics Manufacturing Company, a global supplier of high-performance polyurethane foam products and composite parts, today announced the launch of LAST-A-FOAM® FR-4800 high-temperature tooling board. It is a thermally-stable tooling board ideal for use in applications with challenging performance requirements found in the aerospace, automotive and composite-manufacturing industries. It fills the gap for companies producing high-tolerance parts and who are looking for a tooling system that is both cost-effective and dimensionally predictable and stable. LAST-A-FOAM® FR-4800 is ideal for use in applications with peak temperatures up to 480°F (249°C) and continuous use temperatures up to 400°F (204°C). It is also an excellent alternative to metallic tooling due to a coefficient of thermal expansion (CTE) that is similar to that of aluminum. In addition, FR-4800 is only a third of the density of aluminum with an offered density of 48 pounds per cubic foot. The FR-4800 tooling board provides a much-needed high-temperature, low CTE tooling board alternative that enables the manufacture of tools and parts for prototypes, concept proofs, and short-run production parts. As monolithic graphite tooling continues to increase in use, complexity, and size, the ability to create those surfaces accurately and quickly becomes even more challenging with the current options. “The FR-4800 tooling board is the next generation of material that is very well-suited to perform as the tool or as a foam master for carbon fiber tooling. It can be easily and quickly machined to very complex shapes and deliver the needed foam master in less time and less overall cost than other tooling methods,” said Mitchell Johnson Ph.D., CEO/President of General Plastics. The FR-4800 is used in applications similar to General Plastics’ other high-temperature tooling foam, LAST-A-FOAM® FR-4700, but it offers additional advantages. 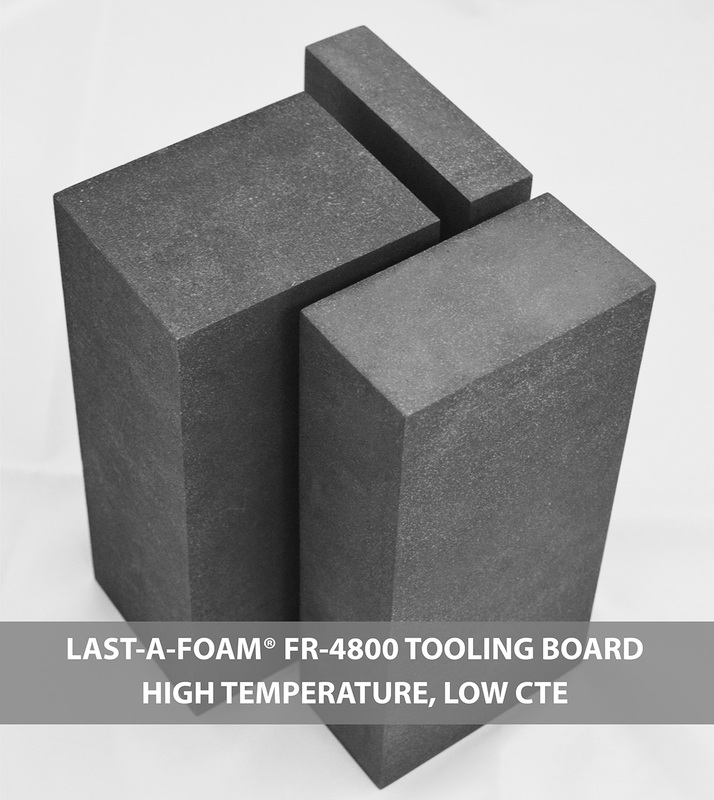 FR-4800 provides customers a tooling board with improved thermal performance due to its lower CTE, higher processing temperature, and improved thermal conductivity. According to Johnson, “our goal with LAST-A-FOAM® FR-4800 was to create a predictable and reliable tooling board that can serve applications where dimensional stability does not dramatically impact autoclave cycle times.” Its CTE is also reliable and repeatable, which allows designers to calculate a tooling correction factor and improve their ability to produce more accurate tooling surfaces. LAST-A-FOAM® FR-4800 can be easily machined, has a consistent cool-down rate, does not warp and is dimensionally predictable, even at elevated temperatures. Applications for this product include fiber-reinforced composites, high-temperature resin systems, prepreg composite layup tools, foam master, monolithic tools and molds and prototype tooling. Commercially available high-temperature adhesives and sealants typically used with syntactic or urethane tooling boards can be used with FR-4800. Please consult our technical sales representatives for more information.